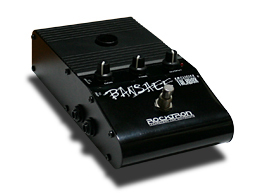 Some talkboxes like Electro Harmonix's Golden Throat Deluxe and Rocktron's Banshee has a built in power amp. With these talkboxes, you could perform with a simple set up consisting only the synthesizer and the talkbox, and is recommended for starters. However, since these built in amplifiers have low power (somewhere between 10W to 40W), depending on the synthesizer's gain level and sound, you may not get the loudness you want. Low output level could result in words not properly heard; the “n” consonant is the most easily affected when output level is too low. These talkboxes also has a gain control, so it is possible to tweek it up to a fairly decent loudness. However, these types of amplifiers tend to sound more compressed (hard attack and overall stiff sounding) as the gain level is increased. You may want to try amplifying the sound with low distortion preamps (like mic pres) before connecting it to the talkbox to avoid this problem. I've went around asking talkboxers around the world which power amps they use, and many have answered guitar amps with speaker output, although many still struggle achieving the distinct Roger sound. Guitar amps have their advantages like tone controls, but combo and head amps are too big. You always want your talkbox to have a warm attack sound (slow attack time) just how a real vocalist sounds. However, even with solid state models, guitar amps tend to sound compressed as you bring up the gain. Depending on the product, distortion is unavoidable even when using clean gain. In order to drive a 100W compression driver, ideally, you should use a 100W power amp (it is also important to have matching impedance). With low powered amps, you would not be able to drive the compression driver at its fullest (you wouldn't hear its true sound), but with 100W power amps, it would be enough to drive the drivers even at low volume (and this is also ideal for practicing at home). From these reasons, the ideal power amp for talkboxes would be small, 100W (8Ohms) compatible, tone control, low distorting pre amp with clear representation of the original sound and having flat frequency response. Acoustic Image makes ideal power amps for talkboxes that meets these conditions. 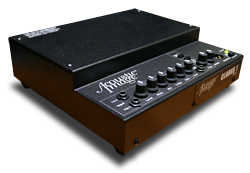 These amps are highly acclaimed by Jazz musicians and are originally made for upright basses. You may think it has boosted bass frequencies and low highs, but it has a surprisingly wide and flat characteristic with clear highs and true representation of the sound. It doesn't add compression and distortion like sounds when the gain level is put up (popular bass amp characteristics these days), so it is also widely used for guitars, vocals, and keyboards. Because it is made for upright basses, it comes with a great 4-band EQ (60Hz, 650Hz, 10kHz, 9kHz +/-15dB) and notch/high-pass filter (30Hz~700Hz). With the high-pass filter, you could keep the thick high frequencies while refining the lows to a nice tense sound. You would also be able to drive the compression driver directly without the need of a network if you cut at 400Hz. Moreover, this D-class amplifier is small (254mm x 228mm x 63mm), light (2kg), low heat, high performance (100W/8ohms), and fan-less. As you can see, this is an ideal amp that solves all the problems talkboxers has been facing. If the budget allows you, Walter Woods’ bass amp, also known as the Rolls Royce of bass amps, is also recommended. Walter Woods' bass amps have even less compression feel and distortion compared to that of Acoustic Image's and literally sounds as if the sound is purely amplified. Through an acquaintance, I had a chance to ask Terry Troutman which power amp he uses, but he has answered me that it is a secret. From this, you could tell how important the choice of power amps are in creating your own original sound. You should also remember that compression drivers are very sensitive so make sure you match the impedance and the output of the power amp and the impedance and the input of the compression driver.